IE "drop-in" connecting rods for 2.0T FSI. Purchase rods as a set or choose our full "Drop-In Rod Package" for all the items necessary to complete your rod job. �VW / Audi 2.0 FSI Engines IE "drop-in" connecting rods for 2.0T TSI. �VW / Audi 2.0 TSI Engines IE 159x21mm connecting rods for 8v, 16v ABA, ABF, and ABA/16V/20v Engines. �Multi Stage Heat Treat for maximum strength, dimensional stability, and fatigue life. �Packed in balanced sets +/- 1 gram. 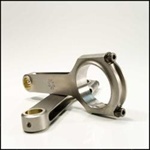 Integrated Engineering is striving to provide a wide range of connecting rods primarily for major European brands. These particular Rods fit the following engines, however they may fit more with custom pistons or other pieces. Please check with us first if there is any doubt. �Combination tested to over 500whp!! 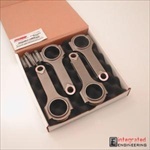 �VW / Audi 16v Engines IE 2.5L 5cyl connecting rods for use with aftermarket pistons. IE VR6 connecting rods for both 12v and 24v VR6 engines. These rods feature the new 3/8 rod bolts instead of the older design using smaller 5/16 bolts.